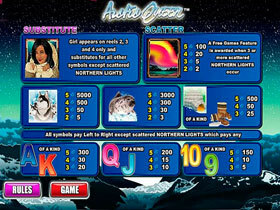 Arctic Queen Slot Information, Screenshot and which online casinos offer Arctic Queen Slot for Play. 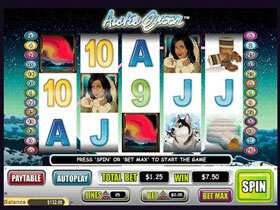 This Online Video Slot is a Wager-Gaming-Technology Slot with a Wild And Scatter Symbols. 5 Reel, 25 Payline non-progressive video Slot by Wager-Gaming-Technology-casinos. This slot features over 24 different winning combinations, Wild and Scatter symbols, Multiplier, Free Spins and a maximum Jackpot win of $100 000. Get warm before taking a trip to the Northern Hemisphere to experience the harsh, icy winter of the Arctic. The game is easy to play with fantastic graphics and animations. Aurora, Eskimo Woman, Husky, Ice Caves, Igloo, Polar Bear, Seals, Snow Boots, Wolves, and high value playing cards. Bets range from 0.01 up to $250 which is suitable for all types of players. The Wild appears only on reels 2, 3 & 4 substituting for all other symbols except the Scatter symbol to complete winning combinations. When 3 or more Scatters land anywhere on the reels the Free Spins feature will be triggered. 8 Free Spins will be awarded with 3x multipliers. The Free Spins feature can be re-triggered when landing 2 or more Scatters anywhere on the reels during the free spins round. This is an enjoyable game offering a calm and refreshing style of play.